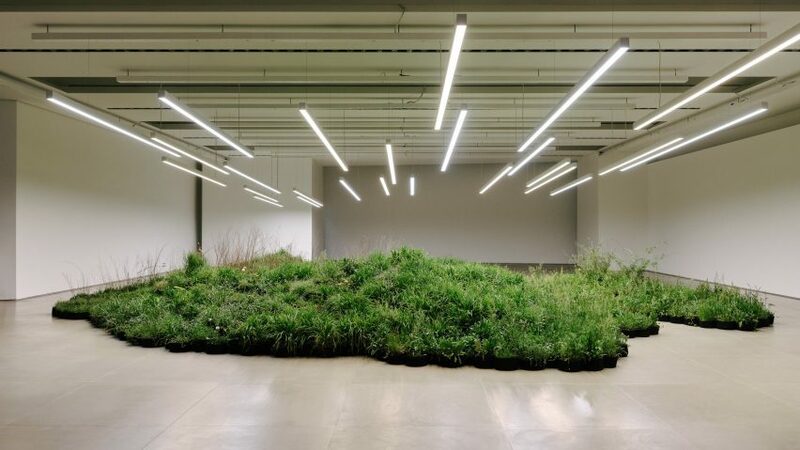 Australian artist Linda Tegg has created a living installation inside Jil Sander's headquarters in Milan, using plants gathered from around the city. Tegg worked alongside the fashion brand's joint creative directors, Lucie and Luke Meier, to develop the Adjacent Fields installation, on show for the duration of Milan design week. The Melbourne-based artist explored some of Milan's abandoned industrial sites with garden designer Matteo Foschi to source what she calls "spontaneous plants" that grow wild in the city. Tegg's work seeks to enhance our appreciation of these undervalued species and encourages the viewer to reconsider their relationship with nature by bringing them into close contact with plants in surprising contexts. "I'm very interested in how we form our opinions about what's natural and what nature means," she told Dezeen during a private tour of the exhibition. "A lot of my work is about trying to undo some of the alienation we have if we only touch things through mediated experiences." Adjacent Field brings together species including mosses, succulents, blackberry, common chickweed, geranium, ivy, scutch grass and wild sage, which grow up through the pavement, through cracks in buildings or on disused patches of land. By removing them from their urban context and arranging them in a gallery-like setting, the plants take on a different status and help to promote a deeper appreciation of nature in the city. "These plants are neither singular, spectacular or of any monetary value," Tegg explained. "They exist alongside us, often on the peripheries of our perception. What happens when these beings are brought to the centre of our lives, when we take them into our care?" The only other materials used in the installation are standard nursery crates and geotextile bags containing soil required to support the greenery's growth. The containers are arranged like a series of islands that create paths in between, so staff and visitors can stroll through the artwork, getting close enough to smell the foliage and observe small insects living among the plants. Tegg explained that the artwork's configuration was not precisely planned, but rather evolved from a desire to maintain the proximity of plants that were taken from the same location. "They're just sort of assembled using this quite modular system," she said. "There is some editing involved but ultimately we couldn't plan how it would look; it's all about keeping the plants together as we found them." A lighting installation by Nic Burnham of NDYLight was developed specifically to provide the correct intensity and spectrum of light to support the plants' growth. During the research phase of the project, Tegg's husband and collaborator David Fox took photographs documenting the plants around the city, which are compiled in a large-format book presented in another room adjacent to the installation. His images are also on display in the windows of Jil Sander's Milanese flagship store, where they provide an alternate but complementary view of the installation. The artwork is on display to the public until 14 April. After that it will be reconfigured into a smaller version that will remain in the studios, with the surplus plants being returned to the sites they were sourced from. The permanent assemblage will require nurturing by the staff at Jil Sander's headquarters, and is intended to provide a constant reminder of the need to work and live more sustainably, in harmony with nature. "Environmental issues seem, and need to be, more and more well rooted, rather than a trend," added Lucie and Luke Meier. "We need to be ready to behave in different ways, even uncomfortable and inconvenient, to make a change. We need to find a way to coexist well with nature. The permanent installation of spontaneous plants will be a constant reminder, a catalyst for our awareness." This is the third indoor work Tegg has developed, following a piece in Chicago created using plants sprouted from grains sourced at local grocery stores, and a work she produced in the Australian Pavilion at the Venice Architecture Biennale in 2018, which used 10,000 indigenous plants to recreate an area of Australian grassland.